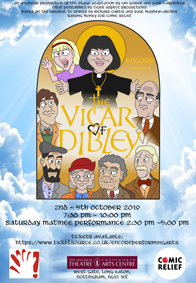 When their elderly vicar passes away, congregation members in Dibley are surprised to find that a woman has been assigned to their parish. And not just any woman -- Geraldine Granger is outgoing, vivacious and fun-loving, as well as caring and committed to her flock. However, her ebullient ways do not initially endear her to the head of the Parish Council, an old-fashioned gentleman farmer who's not a fan of change. Hilarity ensues as Geraldine tries to win over the stodgy council members while staying true to herself and her pastorate.